I love to read. It's been much harder to find the time since becoming a mom, and that's why I belong to a book club. It forces me to read, or make time to read. The greatest thing about our book club, is that it's not "just" a book club. It's "dinner and a book club". Really...what goes better with a good book than a good meal. 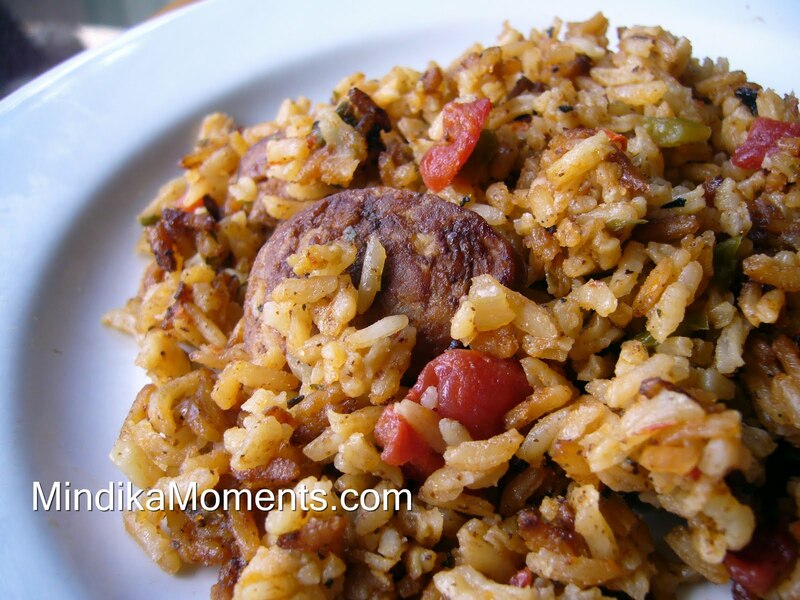 A couple months ago, my good friend Estella made us the most yummy Jambalaya. It was so delicious that we made her share the recipe. Her recipe is kind of a secret recipe that she got from a local restaurant, so unfortunately I won't be able to share that one...but this is my version of the recipe and it's just as delicious! As a side note, Andouille Sausage is a spicy Cajun style sausage. It can be found in most grocery stores. If you can't seem to find it, just ask the butcher. If for some reason you still can't find it, you can just use all smoked sausage. You can also add chicken and shrimp if you so desire. 1. In a large Dutch oven or frying pan, sauté sausages in the olive oil on Medium High heat, until brown. 2. Add the onion, celery, jalapeño(s), and bell peppers. Sauté for 2-3 minutes. 3. Add Chili powder, thyme, cayenne, creole seasoning, parsley, salt and black pepper. Mix well. 4. If you are cooking in a Dutch oven, do nothing. But if you were cooking a large frying pan, transfer everything to a large stove top/oven safe pot, including as much of the juices as possible. 5. Add uncooked rice, and stir well to cover rice with seasonings. 6. Add the beef stock and tomatoes. Stir well. 7. Cook covered on the stove top for one hour on Low heat. DO NOT REMOVE LID! About ten minutes before the hour is up, preheat your oven to 300 degrees. 8. Place the pot in the oven at 300* for one additional hour. DO NOT REMOVE LID until the cooking time is up. This was so good. Definately making this soon. looks perfectly yummy! where do you get the Tony Cachere's Creole Seasoning? I definitely want to try this one!